Don your red hat and bring cheer to both the city and some sparkly causes. Don your red hat and bring cheer to both the city and some sparkly causes on Saturday, Dec. 12. SANTA CLAUS... is one busy elf, but that doesn't mean he doesn't know how to delegate well. 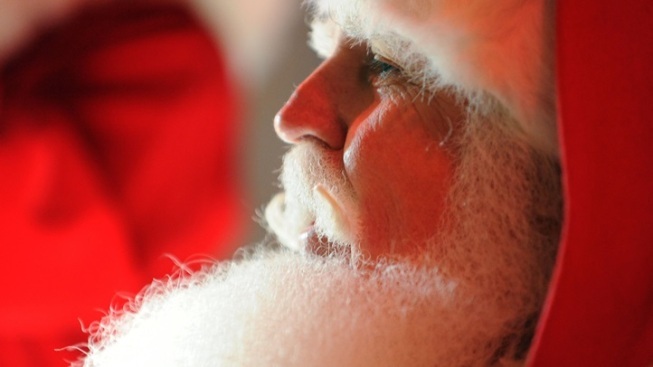 That's why we often see his representatives, who fully embody the spirit of Santa, throughout the season, and that's why it isn't unusual to see a dozen Santas in the same spot, ringing bells or singing or handing out toys. It's all artful delegation, straight from the North Pole. But what happens when thousands of Jolly Ol' Elves converge in one single spot? Well, some memorable snapshots, yes. Probably some running and/or sipping and/or noshing. And a whole lot of fundraising, too. Santa runs and Santa flash mobs and Santa pub crawls have grown in popularity over the last several years, and Reno's vivacious version is one of the largest. Some say well over 10,000 or so Santas show up, but whatever the number, count on being in the middle of a veritable sea of jingle bells and shiny black belts and faux fur-lined boots if you make for The Biggest Little City in the World over the second Saturday in December. THE GREAT SANTA DASH... starts things out that morning, so if you're feeling fleet-of-hoof -- we're assuming you're going with a reindeer costume, if you are -- then trot for Wingfield Park, where a festive 5K will help raise cash for the AIY Foundation, which supports physical fitness efforts at area schools. As for The Reno Santa Pub Crawl, which happens later that day? "(T)his is first & foremost a local charity fundraiser," say organizers, with local schools receiving the sweet proceeds. Taverns and restaurants'll have plenty of drink specials and seasonal treats planned for the big night. But if you're heading into Reno early, on Friday, there'll be holiday-esque happenings, too, so check the schedule. As for dressing up as Santa Claus? Well, some partiers go for the full-on suit, and some for just the topper and/or beard. Others rock a Mrs. Claus outfit, or a general elf-y look (and, again, reindeer are a-ok as an inspiration). The only suggestion, beyond being safe, selecting a designated driver, and bedding down somewhere in the neighborhood of the crawl? Go the garish distance with your look. When you see the really dressy Santas, won't you wish you'd gone beyond the beard? You can do it, aspiring Kris Kringles.